Saturday began early and the team hoped to quickly pass the technical inspection and get the vehicle on the track. We had already missed our opportunities to race on Friday and did not want to continue that today. Following some minor tweaks to the vehicle we were able to get almost everything ready for technical inspection. As there was a slalom component of the technical inspection we needed to have our fuel cell system functioning first. For this we needed to prove to the Shell hydrogen representatives that our system had no leaks. Following a tense several hours hunting miniscule hydrogen leaks with a hydrogen “sniffer” sensor we passed the leak check and had our tank. With our power train functioning fully we did a quick test start of our vehicle to make sure everything was ready for the slalom test. Seeing the vehicle pull away and complete a small lap and to have everything working the team felt a great rush of relief. We were finally ready to pass the inspection. Following a quick visibility check, slalom test, and electronics check we had passed. Unfortunately, hunting for the hydrogen leaks had taken significantly longer than had been anticipated and only one urban concept run remained for the day. We scrambled to prep the driver and brought our vehicle to the starting line cue for the last urban concept run for Saturday. 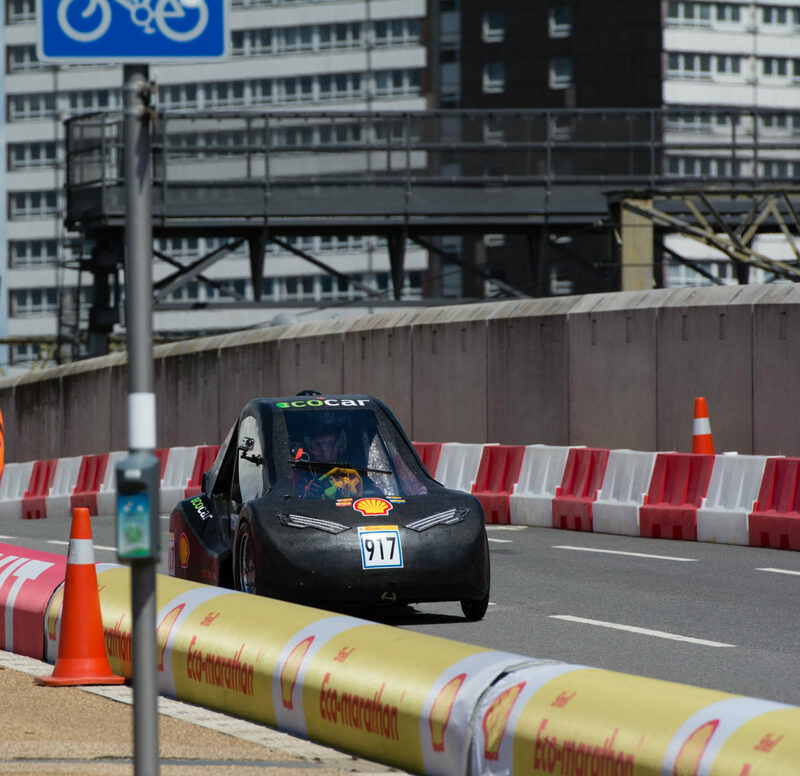 Only two members of the team were allowed to accompany the vehicle onto the starting line. We sent our electrical and fuel cell leads as they had the most experience trouble shooting the fuel cell and would have the best chance of fixing any last minute problems that may come up. The rest of the team had to wait beside the side of the track and watch as everything unfolded. It was a fairly stressful time to see the vehicles take off one by one and watch our car get nearer and nearer to the starting line. Finally our turn came and our car pulled away from the starting line. The race had begun! In order to complete a successful run 10 laps must be completed with 3 stops in a designated area to help simulate driving in an urban setting. There is a maximum time each vehicle has to complete the 10 laps and 3 stops, however, as the competition is focused on fuel efficiency it is beneficial to drive the vehicle to come in just under the allowed time. This tactic can be risky and several teams had stuck to close to the allowed time and missed it by several seconds resulting in an invalid run. For this reason our team had several members timing each lap and calculating the remaining time to ensure that we would be able to complete the race in the allotted time. Our car would need to travel at speeds just above 25km/hr to do this. The team stayed in touch with the driver over walkie talkie and communicated times and other race strategy info to ensure the driver was maintaining pace. The driver was required to use a hands free set and unfortunately the ambient noise in the vehicle made it very difficult to understand what the driver way saying. This made it more of a challenge to communicate with the driver. After two or three laps it became apparent that there were some issues with the vehicle. However, communication with the driver was not clear and the team was unable to determine what was slowing the vehicle down. On the 4th lap a brief and choppy massage came through the radio “I have to stop…broken”. That was all the team was able to get on the radio before we saw the vehicle exit into the pit lane and the driver get out. The nose support for the vehicle body had come loose as the vehicle vibrated and the nose had dropped so that the front wheel wells rubbed on the wheels. Also, the driver explained that there were some issues with the electronic throttle and that he was having trouble getting the car to accelerate correctly. With one unsuccessful run down, the team got to work to create a more secure nose attachment for the body that would be able to withstand the vibrations from the road. The electronic pedal code was also analyzed and it was discovered that there was a division/multiplication error. Instead of multiplying the signal coming from the pedal, it had been divided. This meant that our vehicle had been running on roughly half of its available power. With this fixed we would be able to get much better acceleration out of the vehicle. As the urban concept runs had finished for the day the car was taken to the indoor test track and several laps were completed. The focus was to make sure the pedal output had been fixed and that the correct power was being drawn from the fuel cell. Following the practice laps everything was looking good and with the new access to the vehicles full power it seemed that we would easily be able to complete the race on time. Unfortunately, just as the vehicle was taken off the test track a small hydrogen leak was discovered. The technical inspection station was closed for the evening so we would have to wait until morning to get the hydrogen “sniffer” to be able to find the exact position of the leak. So ended the second day of competition, it had been just as eventful as the first and we had put in 1 attempt at a successful run. Unfortunately due to throttle and vehicle body issues this run was invalid. Things were looking more promising for the final day.